For some time I have appreciated the simplicity that is the dip pen nib, or “pen” as they were called back in the day. The nib frankly is the business end of the writing instrument, and as such the holder was really secondary to the writing experience. In today’s writing equipment world, the pen is the entire instrument, and the nib just the actual gold, steel, palladium, glass, or titanium bit that transfers the ink to the page. 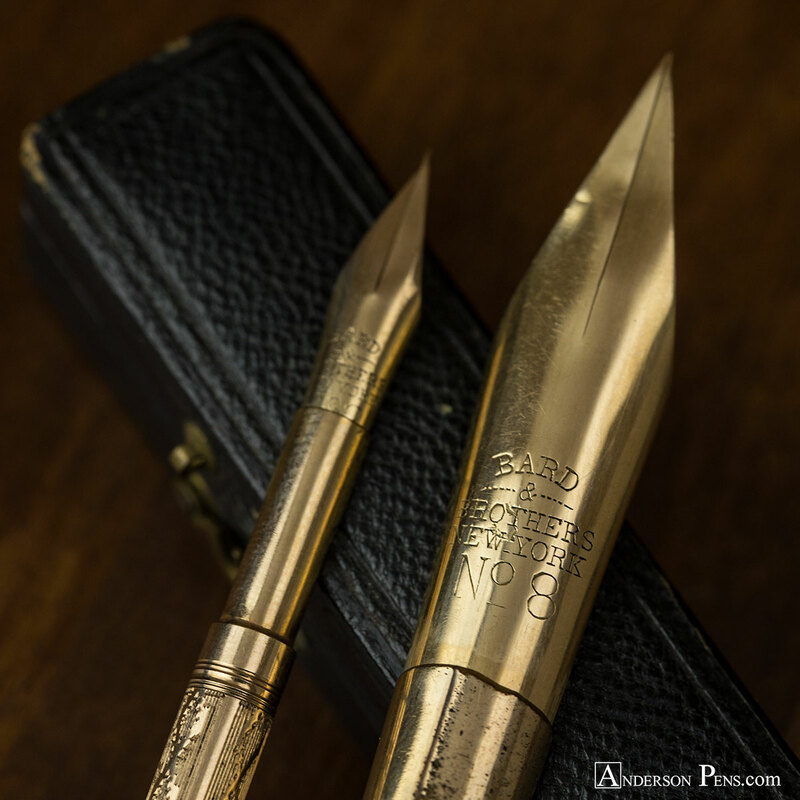 There is something so beautiful about vintage gold dip pen nibs. They all appear to be very similar, but they are far from the same. Some nibs will be more flexible than others, and some will be more ornate. Bard & Brothers was an early predecessor to the famous Mabie Todd & Bard, which preceded Mabie Todd & Co. of New York and London. 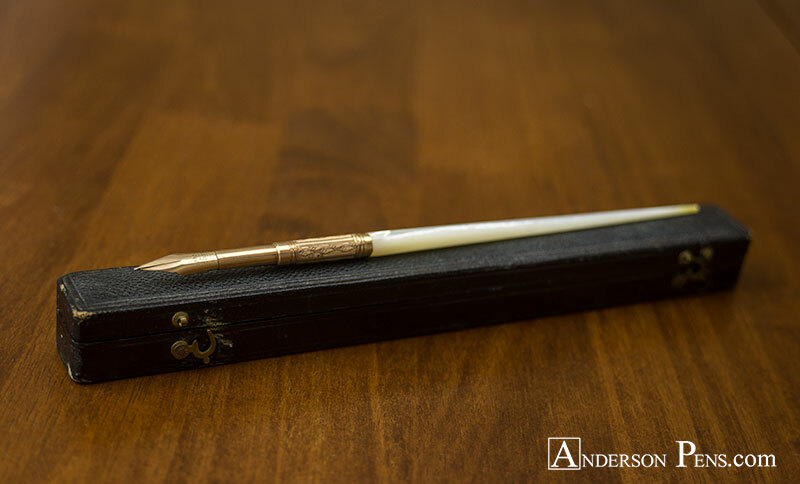 Mabie Todd & Co. was most famous for the “Swan” Pen. Bard & Brothers was a short lived company for only two years from 1849 to 1850. Finding a Bard & Brothers nib is a chore in and of itself, but I found these two nibs at the same pen show in both the smallest and largest size. Of interesting note is the wear pattern on the holder of the #8 nib. 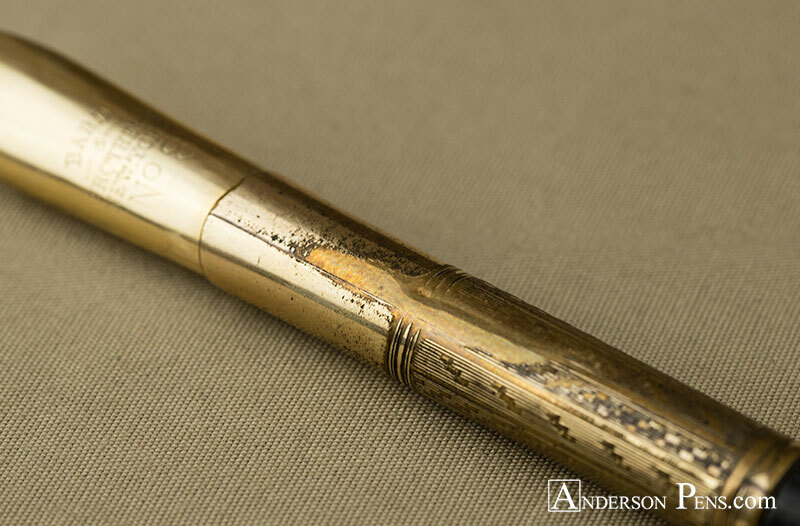 You can tell this pen was used often, so much that the gold fill on the section wore to the owners hand positioning. This gives me a real connection with the original owner. You just have to hold the pen in the same manner. Of course, the Bard & Brothers nibs are flexible, as most dip pen nibs from this era are. Common to dip pen nibs, there is no need for a breather hole. This adds to the clean and simple look, and one of the reasons I love these pens. Therefore, one must take great care to not over flex the nib and cause the slit to crack further, a common malady with larger nibs. The nibs are not marked as to gold content, but this was an era before all gold was marked. One can’t help but wonder what letters may have been written with such a glamorous nib. Who was the owner of this huge pen? Was it a business man, an executive or bank manager? We may never know, but the #2 pen did come with the original box with the owner’s name, Mary A. Gould, written in pencil on the ivory silk inside lining. The box has two charming hook latches to keep the lip shut and secure, and a purple velvet bottom lining. A durable leather outer completes the box, which would have made for easy transportation. 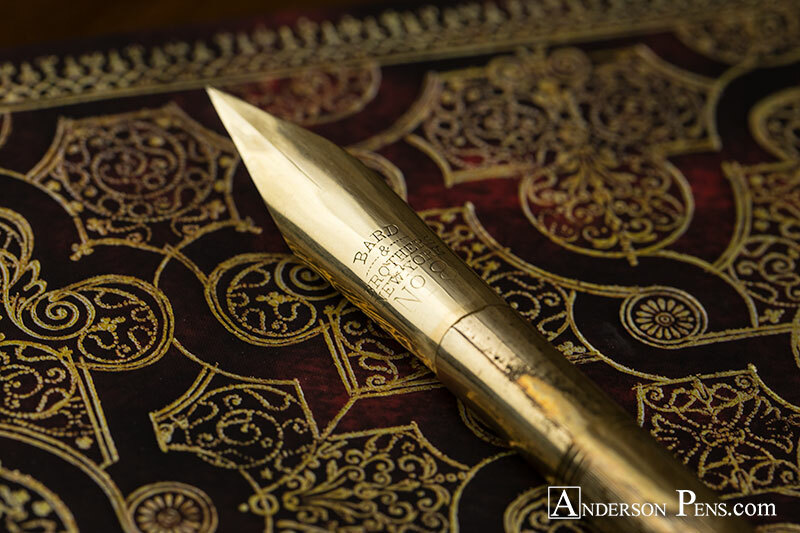 The #2 nib comes with a mother of pearl taper with a patterned gold filled section. The #8 has a similar gold filled section but a wood taper, much like the Esterbrook Mammoth Falcon pen. 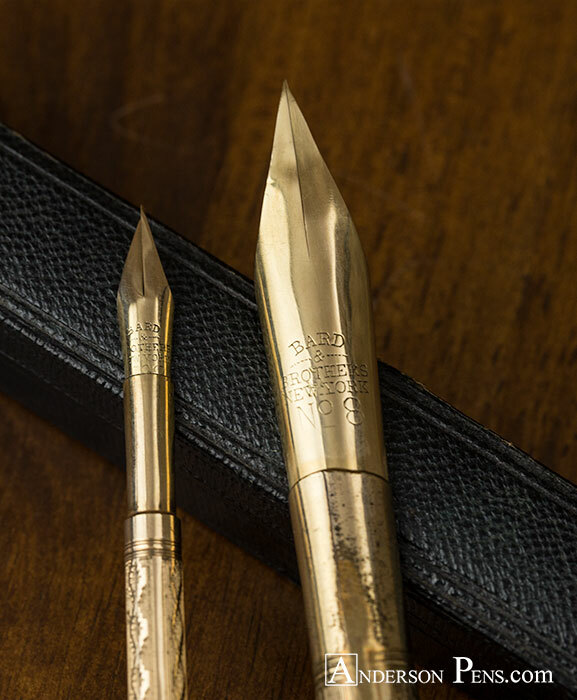 The section is specific to this grand pen as large nibs like these often required their own specific holders. So, combining the relative rarity with the beauty and simplicity make Bard & Brothers one of my favorite pens. This entry was posted in My Favorite Pens, Vintage Fountain Pens and tagged Bard Brothers. Bookmark the permalink.